Least developed countries (LDCs) – a category defined by the UN – are home to 15% of people living in developing countries. But of the 1.1 billion people in the poorest 20% of the developing world, at least one third live in LDCs. On the face of it, proportions of aid are broadly comparable to these shares. LDCs received 30% of total official development assistance (ODA) in 2012. 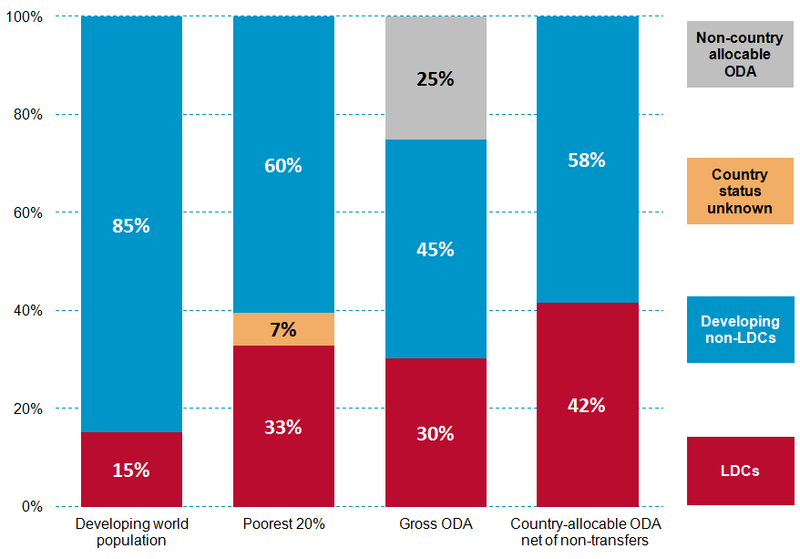 As a proportion of aid directly allocated to countries – so excluding regional aid and support for global public goods, and after taking out monies that are not actually transferred (for example administrative expenses and costs of educating foreign students) – LDCs’ share is higher (42%). Source: Development Initiatives calculations based on aid data from OECD DAC Creditor Reporting System (CRS), population and poverty data from World Bank Development Research Group (PovcalNet, the on-line tool for poverty measurement). The share of ODA going to LDCs may be in line with the proportion of the poorest 20% of people living in these countries, but this does not take into account the generally much deeper level of poverty experienced by those in LDCs compared with other developing countries. While the average daily income for the poorest 20% living in non-LDCs is PPP$1.29, it is much lower in LDCs (PPP$1.09). Source: Development Initiatives calculations based on World Bank Development Research GroupPovcalNet. Covers only countries with sufficient household survey data only: 78 non-LDC developing countries and 38 out of the 48 LDCs. In addition to a greater depth of poverty, government capacity in LDCs is lower and is set to remain so. Annual government spending per person in LDCs is currently less than PPP$470 (PPP$1.30/day) – around one fifth of the levels in non-LDC developing countries. By 2030, government spending in non-LDCs is projected to more than double. Although spending in LDCs could rise by two-thirds by 2030 to reach PPP$810 annually (PPP$2.22/day), this would still be only one sixth of the level in other developing countries. Source: Development Initiatives calculations based on IMF World Economic Outlook, World Bank and Oxford Economics data. This non-transfer ODA figure excludes all aid that did not go to a particular country, including aid going to regions and aid that has no specific destination (e.g. development research). All figures based on 2005 purchasing power parity (PPP) international dollars. All figures based on 2011 purchasing power parity (PPP) international dollars.